What is the best description of the greenhouse effect? What exactly is the greenhouse effect? And what does it look like if we view it from a new angle? Of course, we know the answer, and Raymond Pierrehumbert has written an excellent paper about it (Infrared radiation and planetary temperature). Computer code used in climate models contain all the details. But is it possible to provide a simple description that is physically meaningful and more sophisticated than the ‘blanket around earth’ concept? I wanted a description that could be grasped by physicists. Without the clutter of too much details – just the essentials. A ‘back-of-the-envelope’ type derivation of the greenhouse effect. The starting point was to look at the bulk – the average – heat radiation and the total energy flow. I searched the publications back in time, and found a paper on the greenhouse effect from 1931 by the American physicist Edward Olson Hulburt (1890-1982) that provided a nice description. The greenhouse effect involves more than just radiation. Convection also plays a crucial role. How does the understanding from 1931 stand up in the modern times? I evaluated the old model with modern state-of-the-art data: reanalyses and satellite observations. With an increased greenhouse effect, the optical depth increases. Hence, one would expect that earth’s heat loss (also known as the outgoing longwave radiation, OLR) becomes more diffuse and less similar to the temperature pattern at the surface. An analysis of spatial correlation between heat radiation estimated for the surface temperatures and that at the top of the atmosphere suggests that the OLR has become more diffuse over time. The depth in the atmosphere from which the earth’s heat loss to space takes place is often referred to as the emission height. For simplicity, we can assume that the emission height is where the temperature is 254K in order for the associated black body radiation to match the incoming flow of energy from the sun. Additionally, as the infrared light which makes up the OLR is subject to more absorption with higher concentrations of greenhouse gases (Beer-Lambert’s law), the mean emission height for the OLR escaping out to space must increase as the atmosphere gets more opaque. There has been an upward trend in the simple proxy for the emission height in the reanalyses. This trend seems to be consistent with the surface warming with the observed lapse rate (approximately -5K/km on a global scale). One caveat is, however, that trends in reanalyses may be misleading due to introduction of new observational instruments over time (Thorne & Vose, 2010). Finally, the energy flow from the surface to the emission height must be the same as the total OLR emitted back to space, and if increased absorption inhibits the radiative flow between earth’s surface and the emission height, then it must be compensated by other means. The energy flow is like the water in a river: it cannot just appear or disappear; it flows from place to place. In this case, the vertical energy flow is influenced by deep convection, which also plays a role in maintaining the lapse rate. A popular picture of the greenhouse effect emphasises the radiation transfer but does not explicitly account for convection. As a result, it fails to explain the observed climate change. Hulburt’s old model from 1931 included both radiative energy transfer and convection. It has now been validated against state-of-the-art data, and non-traditional diagnostics show a physically consistent picture. An increased overturning can even explain a hypothetical slowdown in the global warming, and the association between these aspects can be interpreted as an entanglement between the greenhouse effect and the hydrological cycle, in which a reduced energy transfer associated with increased opacity is compensated by an acceleration of the hydrological cycle. This also makes a link with clouds. The old conceptual model also explains why the so-called ‘saturation’ (which doesn’t exist on Venus) is a red herring, which is also explained in the report by the Copenhagen Diagnosis. I think those who present this argument have a poor understanding of what the greenhouse effect is all about. A bold proposal: One way to view the greenhouse effect is the vertical distance between the place where incoming energy is deposited and where the average outgoing heat loss takes place. This distance depends on the concentration of greenhouse gases, and at what height the OLR can escape to space without being reabsorbed by air above. The graphics below provides a crude illustration: the OLR is determined by Stephan-Boltzman’s law and the temperature at the same height, and the surface temperature is then given by the emission temperature, the emission height, and the lapse rate. A more elaborate description is given in (Benestad, 2016), which was inspired by two posts here on RealClimate (here and here). Not all of my colleagues may agree with my description of the greenhouse effect; it was a struggle to get this paper published. To my surprise, I realised that there are scholars with different ideas about it. However, I hope that my description will lead to more discussions and debate about the over-arching principles and our basic understanding of this phenomenon. This also touches upon the question of climate sensitivity which is merely defined in terms of temperature change. A response to increased greenhouse gases could involve both a global warming and a speed-up of the hydrological cycle if the greenhouse effect and the hydrological cycle are intertwined. In other words, there could be more dramatic changes to the rainfall patterns than the temperature, but this doesn’t necessarily imply that the climate is less sensitive to the forcings. I’m glad our paper made it – congratulations. I think it is a great contribution. A way of looking at radiative transfer that I find useful but rarely mentioned is the Rosseland model. For some reason the best account I have seen is in a CFD manual. Maybe others know it under different names At high opacity, heat transfer is diffusive, with diffusivity inversely proportional to absorptivity. The rule of thumb for accuracy seems to be OD>3, so it doesn’t really apply to atmosphere (also it is a gray body model). But the concept helps. The “diffusive” flux induces a temperature gradient, which steepens the lapse rate. That is my way of seeing that the radiative equilibrium gradient tends to convective instability. But does it get there? You have shown observations which seem to say that it does, at least sometimes. On the other hand, observed lapse rates seem to fall well short of DALR. Maybe moisture and latent heat is enough to make he difference? I see you talk about this toward the end of section 4. Sorry this is a rather hasty comment, but it’s late here – I’ll look forward to reading the discussion in the morning. I cite Hulbert’s paper as the first description of a radiative-convective model. It wasn’t until 1964 that Manabe and Strickland put one on a computer, giving us one of the first estimates of climate sensitivity due to doubled CO2 (among other things). But Hulbert figured the idea out first. Laboratory experiment with CO2 and a candle and infrared visualisation. Showing the heat trapping properties of carbon dioxide. Since you have added convection to the list, what about adding conduction? Any discussion on that possibility? It certainly seems to have some importance in surface level heat transfer. The IR opacity sets the altitude from which the lapse rate is suspended. Mountains are cool, Death Valley is hot. Hoisting the lapse rate run with altitude by increasing the IR opacity raises Death Valley to the Plains and the Plains to the mountains. This seems like a widely understandable description. He read the papers of Fourier, Tyndall, Arrhenius, Ekholm and others, recording information and comments in voluminous notebooks. He saw that the work, though then not held in high regard, had merit—but was badly in need of updating. This would have been in the years from about 1930 on. Was Hulburt one of the ‘others’? If so, how much did he contribute to the revival of interest in the question? Anybody have a copy of Fleming’s bio of Callendar they can check against? The next step is to try and handle a simplified day/night model. No longer can you assume pointwise thermal equilibrium, but must include heat storage terms. Also convection in the lower atmosphere shuts down at night, and you often get a low level temperature inversion. But time integration of the atmosphere becomes messy, because of the behavioral discontinuity between a convective lapse rate, and no convection. But please, tell us more – what was the pushback to your article about? I like the thermal resistance model. Heat flows from a high temperature reservoir (the Sun) through Earth to the cold reservoir (the Cosmos). Greenhouse gases decrease the thermal conductance from Earth to space. I like the photon tracking version of a simple explanation. Here is one version of that version. Corrections or improvements to it would be welcome. The Greenhouse Effect 101. To balance incoming short-wave solar energy, the earth constantly radiates long-wave heat energy (infrared photons) back out to space. This is how the earth maintains a fairly constant temperature. Some of the outgoing radiation is absorbed & re-radiated back to earth by various trace gases like carbon dioxide, water vapor, methane, & ozone. This gives us the greenhouse effect, & keeps the earth from becoming a ball of ice. The warming effect works according to the laws of quantum physics. When an infrared heat photon of a specific energy collides with a greenhouse gas molecule, that photon will be absorbed & an excited electron will jump to a higher orbit. However, that new electron orbit is not stable & will soon fall back to its “rest” energy level & emit a photon of the same energy level (frequency) that was absorbed. While the original photons were on their way out to space when they were absorbed, the new photons will be radiated in a random direction. Some will continue up, some will return toward earth. It is this back-to-earth radiant energy that causes the underlying earth to warm to a new equilibrium temperature. Because of its complexity, only computer models can adequately quantify the greenhouse effect. The exact magnitude of this effect caused by gases humans are adding to the air is not yet precisely understood, but all models to date have shown various amounts of warming. None show the earth cooling or remaining the same. A non-mathematical description of the GH effect is from the Barrettbellamy website: The Earth’s atmosphere is moderately trans­parent in the visible part of the spectrum and the majority of the solar radiation can pass through the atmosphere without being absorbed and is absorbed by the surface which is thus warmed. On the other hand, minor atmospheric constituents, the greenhouse gases, of which water vapor is the most important, ab­sorb strongly in the infrared region which is where the Earth’s surface emits. The atmosphere is largely opaque to the terrestrial infrared heat radiation. According to Fleming p. 70, Callendar’s notes do refer to Hulburt’s 1931 paper which Callendar said supports the CO2 theory. Hulburt was the first to add anything new to the subject since Arrhenius. Hulburt has a nice equation for heat balance that any student can understand. What is most important though is that no one paid any attention to Hulburt’s paper. Callendar did not cite it in his 1938 paper. In a 1956 article in the popular magazine Weatherwise, Hans Panofsky (1918-1988) of Pennsylvania State University reviewed the different “Theories of Climate Change.” He classified them under the headings (1) Earth’s Crust: shifts in the position of the poles and mountain building; (2) Atmospheric: CO2 variations; and (3) Astronomical: changes in the Sun’s intensity or the Earth’s orbit. He did not mention Hulburt. Hulburt’s paper, which could have made a real difference, went virtually unnoticed and uncited. I think this only makes sense in the limit where the atmosphere is perfectly transparent to solar radiation. Hulburt’s paper deserves to be famous as a neglected discovery. To be sure, including convection should have been obvious… but it was not obvious to others for decades. Why was the paper overlooked (and almost never cited until recently)? I suspect its original sin was being published in the Physical Review, a top journal but one that otherwise was of not interest to climate/meteorology researchers of the time. Further, Hulburt was a government physicist who mainly worked on radio propagation, not someone in their community. The lesson is that it’s not enough to publish, scientists must also take some trouble to publicize their work to relevant communities. #12–James, thanks for that response! Had Callendar latched on to the Hulburt model, things might have gotten quite a different spin, perhaps, in terms of the ‘mental model’ at least. I like the attempt to provide a simple description of the greenhouse effect. However, I find it misleading to mention the Beer-Lambert law when discussing the outgoing longwave radiation (OLR). The Beer-Lambert law can be applied on the incoming solar radiation, but it is not valid when emission is significant, that is the case for OLR. Yes, the emission from the surface will be absorbed following the Beer-Lambert law, but the strength of the emission is directly coupled to the absorption efficiency and this coupling is essential to understand the greenhouse effect. In short, if the absorption is zero at some point in the atmosphere, at some wavelength, there is no emission from this point, at this wavelength. If there is absorption, there will also be emission. That is, absorption and emission can not be treated separately. For further reading, google “Schwarzschild’s equation”. I am not sure about the reference to “saturation” (and I have not read the Copenhagen report), but that could be associated with this issue. If the Beer-Lambert law would totally govern OLR, I would say that a saturation could occur. Please correct me if I am wrong, but this part does not seem right to me. My understanding is that photon absorption and excitation of a greenhouse gas molecule causes the molecular bonds to vibrate and/or bend, akin to a spring stretching and compressing and/or bending. That said, since molecular bonds are in fact shared electrons, the vibration/bending may well involve electron valence jumps, my understanding is fuzzy on that. In any case, although this molecular excitation is not stable and will soon spontaneously relax with the emission of a new photon, in the lower to mid troposphere relaxation is far more likely to occur through collision with another gas molecule than through emission of a new photon, thereby warming the atmosphere directly. 17 Jim Eager: “Infrared radiation and planetary temperature” by Raymond T. Pierrehumbert gives some of the greater complexity, but not too much. I take it that the quantum mechanics becomes very complicated very fast. Thanks Rasmus for the link. That thing about vibrations in bending versus what the electrons are doing is farther into quantum mechanics than I got too. I could guess that it could have something to do with p orbitals, but that is just a guess. Thanks for the post and for Pierrehumbert’s article. I like them both and the animated graphic. Saturation fallacy: Now I know where that comes from. Tell Raymond T. not to ride a bicycle on the snow. The main label in figure 1 says “relative humidity”, but the caption says total column water vapor — typo? This comment seems to imply that emission only occurs when there is an absorbed photon, but this is not the case. It is rather the opposite, there is no direct connection between incoming radiation and emission. To go on into details, this is in fact related to my comment above (@16), by something denoted as local thermodynamic equilibrium (LTE), that is assumed by the “Schwarzschild’s equation”. LTE is a valid assumption for the atmosphere below about 50 km. LTE is a difficult concept, but it implies that the distribution of (the relevant) quantum states of the molecules is governed by the local temperature, not by radiation. This is basically explained by Rob in his last statement. Relaxation will most likely occur by collisions between the molecules, and not by emission of a photon. That is, LTE is valid when there are frequent collisions between the molecules. This is not the case at high altitudes, and LTE can not always be assumed in e.g. the mesosphere (but the exact altitude limit differs with wavelength). To be clear, absorbed incoming radiation will tend to increase the local temperature, that indirectly can affect the emission. However, the main point is that there is no direct coupling. This can seem to be contradictory to my comment above that absorption and emission can not be treated separately. What I meant is that you need to include both effects into your expression for radiative transfer, and then you get the Schwarzschild’s equation. When I wrote “absorption” I meant the efficiency for absorption, not the actual amount of radiation absorbed. I was a bit sloppy there, in an attempt to be brief. Being more detailed I would express is it as: If an air parcel is totally transparent at some frequency, there is no emission at this frequency. But if the air parcel has the potential to absorb at the frequency, then there will be emission. Note, for emission it suffices that the air parcel has the potential for absorption, no radiation has to be absorbed to induce emission. In technical terms, the absorption and emission coefficients (in e.g. 1/m) are equal. Sorry if this got complicated, but nature is not always simple, especially when quantum physics is involved as happens to be the case here. But note that all this is of course taken into account in climate models, as well as when analysing remote sensing observations of the atmosphere (my profession). “What exactly is the greenhouse effect?” It is easy to define the GHE, but it is difficult to calculate it. 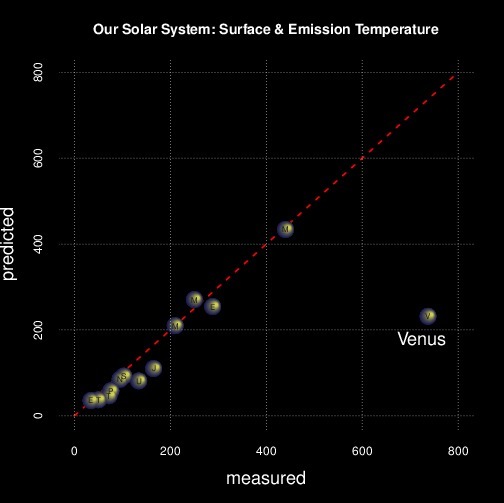 Consider a planet which is covered by a thin (some km’s thick) special layer: The absorption of the sunlight in the visible is small and the absorption of the IR radiation is large. The GHE is the difference of the surface temperature with and without the layer. The calculation is easy for a glassy planet. In this case the layer consists of fused quartz. Radiative transport through the layer is neglible. The heat transport is determined by the thermal conductivity of the glass which is diffusive and isotropic.So the GHE increases with the thickness and the thermal resistance of the layer. A similar case is the snowball-planet. The difference is that small ice crystals may cause a large albedo. Next we consider an aqua planet: no atmosphere, no land, only oceans. In this the case the radiative transport and the thermal conductivity by diffusion in the layer are neglible compared to convection. Convective transport is anisotropic:vertical and horizontal transport are different. The large meridonial transport indicates that you have to use a nonlocal model to get the right latitudinal dependence of the surface temperature. Next the GHE gas planet: the layer consists of an atmosphere with green house gases. In this case the radiative transport may not be neglible in the layer. Convective transport is complicated: the adiabatic lapse rate is modified by the condensation of water vapor. I doubt that a simple calculation can result in a good estimate of the GHE. In the abstract of the publication of E.O. Hulburt (1931) ‘The Temperature of the Lower Atmosphere of the Earth” a temperature rise of 4°C is predicted for doubling the CO2-concentration in the atmosphere. I think this estimate is too large. Unfortunately, this historical paper is paywalled. So I decided: fortget it and make your own calculations. Global heating has an unmistakable unique human fingerprint attached to it. Scars and blight on the landscape, acidosis, rapid oxidisation of vegetation. Pathology of death: asphyxiation and hyperthermic stress by greenhouse gasses; bio-toxic ocean acidification by same. Extreme stresses on environment by out-of-control exponential human population growth. Cause of death: sudden release of 100’s of millions of years worth of fossil hydrocarbons within the timeframe of 270 years. Motive and intent of murder: Comes down I’m afraid to nothing more complex or substantial than just basic greed and/or theft coupled with rampant, ego driven ignorance and arrogance with absolutely no thought given to the future. Profile of perpetrator: Sociopathic, delusional and psychotic, as the Buddhist would call it, complete lack of innate awareness on every level. Thanks Edward, I just downloaded Ray’s Infrared Radiation and Planetary Temperature. Our diagnostics yield an estimate of about 4–5 days for the global mean residence time, which is about half compared to depletion times that are commonly interpreted as proxies for the residence time. The discrepancies to depletion times are mainly explained by the fact that these are based on simplified representations of precipitation processes. The revised picture given by our results is supported by the overall consistency with the footprints of precipitation producing weather systems in different regions of the Earth. This description of the GHE seems to imply that the primary mode of energy loss to space is from GHG emission; alternatively, it could also be interpreted to say that the atmosphere is behaving as a blackbody absorber/emitter. If you look at a graph of the top-of-atmosphere OLR, the majority of power flux is in the region of about 8 to 25 or 30 microns, minus a sharp ozone absorption at 10 microns and a broad CO2 bending mode absorption at 13-17 microns (ignoring the almost continuous water absorption). The implication to me is that the main GHG effect is to warm the surface to a temperature where emission in the most transparent regions of the OLR spectrum is great enough to make up for the reduced transmission in the GHG absorption regions. Clearly convection plays a major role in heat transfer to the mid and upper troposphere, but it is largely irrelevant because greenhouse gas emission is still a smaller amount of energy loss from the planet compared with increased radiation from a warmed up surface through the more atmosphere-transparent portions of the OLR spectrum. This is an argument based on qualitative examination of the top-of-atmosphere outward bound spectrum and not from any modelling, so I am receptive to more sophisticated argumentation. To maintain thermal equilibrium, the earth must emit as must radiation energy to space as it receives from the sun. There is a point at the top of the atmosphere where photons make their final escape to space from excited CO2 molecules. Adding more CO2 molecules up there provides more opportunities for them to intercept such photons and redirect that energy downward. Everything after that is just a matter of tracking where the trapped energy goes, not whether it is trapped. With the apparent luke-warming of the troposphere, he claims that that disproves AGW. Thanks for a most interesting paper, and this article. For your information I have brought it to the attention of Roger Helmer MEP, who is the United Kingdom Independence Party spokesman on energy and industry. RealClimate [is the] Home of arch-Mannipulator Gavin Schmitt and his rapid reaction ‘Crusher Crew’. Personally, I prefer the ‘Beano’ myself. More scientific credibility, you see. Thanks for a most interesting paper and, particularly, for providing computer code enabling the results to be easily replicated and investigated. It is a great pity that so few professional climate scientists make their code available. If more followed your example, I think it would result in increased confidence in their work and results by scientifically and technically minded people who, quite reasonably, want to convince themselves of the validity of results before they will accept them. The consistent, near linear, increase in bulk emission altitude that you find over 1979-2011, with a trend of just under 23 m/decade implies, as you say, GMST warming of 0.12 K/decade (0.117 based on your lapse rate of -5.07 K/km). Interestingly, this is almost the same as the forced trend of 0.122 K/decade over 1977-2008 found by Delsole et al. (2011; DOI: 10.1175/2010JCLI3659.1) after excluding unforced multidecadal variability. The GMST warming rate of 0.117 K/decade can of course be converted into an estimate of the transient climate response (TCR) by multiplying by the forcing from a doubling of CO2 concentration (3.71 W/m2) and dividing by the trend increase in forcing over 1979-2011. Using the IPCC AR5 forcing estimate timeseries, gives an estimate for TCR of 0.82 K. This is depressed by a positive trend in volcanic forcing, which seems to have a low efficacy, perhaps ~0.5. If only anthropogenic forcing is used (implying an almost zero efficacy for volcanic forcing), the TCR estimate would be 1.34 K.
I have made sure Mr. Helmer is aware of the correct spelling of your name Gavin. He has finally deigned to reply to me, but is prattling on about “negative CO2 climate sensitivity”. I feel certain he has yet to read Rasmus’ article, let alone the linked paper. Looking on the bright side the ad homs have ceased, for the moment at least. It is a great pity that so few professional climate scientists make their code available. If more followed your example, I think it would result in increased confidence in their work and results by scientifically and technically minded people who, quite reasonably, want to convince themselves of the validity of results before they will accept them. Oh sure. “Of course” scientists can’t be trusted to report their results truthfully, unless random “scientifically and technically minded people” can pick through their ad hoc data-reduction programs for bugs. As a scientifically and technically minded person myself, I rely on my scientific meta-literacy to assess the credibility of a report. If a finding is accepted by the National Academy of Sciences, for example, I’m pretty sure I can trust it. For practical purposes, if I hear from a lopsided majority of the scientists who’ve put the time in that GMST will rise if carbon removed from the atmosphere millions of years ago is released back into it, that’s good enough for me. I don’t know about Nic Lewis’s friends, but I’ve got more productive things to do than replicate all science since Archimedes. A useful marker of Local Thermodynamic Equilibrium is that the distribution of energy in all modes of motion (translational, rotational and vibrational) can be characterized by the same temperature. A key to understanding what happens when a CO2 (or H2O) molecule absorbs an IR photon is that the radiative lifetime of CO2 is about 1.5 sec while the time between collisions in the atmosphere at the surface is about a tenth of a nanosecond, and it takes about 1000-10,000 collisions on average for vibrational to translational energy transfer. This means that a vibrationally excited molecule can only retain their excitation for a few microseconds. OTOH, LTE tells you that some proportion of CO2/H2O molecules will be vibrationally excited by collisions at atmospheric temperatures. This produces a steady state population in the CO2 bending mode of about 5%. This vibrational excitation is characterized by the local temperature, not the temperature of the levels from which radiation is absorbed. An interesting and useful discussion, but I was mildly surprised to find that I needed to scan down to Jim Eager’s contribution (#17) to see mention of the importance of vibrational/rotational modes in the GHG molecules in causing the heating. GHG molecules (CO2, CH3, H2O…) are typically asymmetric polyatomic molecules, whereas the dominant atmospheric gases (N2, O2) are too tightly bound to absorb at IR frequencies. As Eli Rabett (#32) points out, the main de-excitation mode will be via a collision with N2 or O2, and the excitation energy of the GHG molecule is removed as kinetic energy of the colliding molecule. The image I have is of a ping-pong ball tossed into a rotating fan – it comes out faster than it went in, and this kinetic energy is then dispersed through the surrounding gas as heat. To use a chemical analogy, GHGs can be seen as catalysts converting radiant energy into heat. The point of this description is that it directly addresses the fundamental basis of the Greenhouse Effect in a way that can be readily understood by a non-specialist. It doesn’t have to be seen as something mysterious that must be taken on trust. Personally, I suspect a larger factor influencing confidence in the work and results of climate scientists might be the tendency of some scientifically and technically minded people to over-estimate their competence to comment on the field, often leading them to identify clearly spurious ‘errors’ based on their own lack of comprehension. When such work is widely disseminated to the public, less scientifically and technically minded people may, quite reasonably, find themselves confused as to whose results to trust. Perhaps it’s tiring to keep getting comments like mine, but have you looked at this and/or commented on it? Not sure my first attempt got through… Have you seen and/or commented on this? How should we interpret the apparent absence of trend in total column water vapor in the paper’s Figure 1? Should we expect to see a rising trend (WV feedback) on these timescales, and if so, why don’t we? Peter, the mere fact that Willie Soon is the lead author should tell you something. Chris Machens (#3), looking at the video, it appears to me that the bit involving putting out the infrared image of the flame (but not the flame itself) begins at 20 minutes 50 seconds. Love the video, by the way. I have the segment specific to the flame at the top of my webpage. (See the link in my name. The webpage is designed as an interactive resource for explaining the greenhouse effect, focusing primarily on radiation transfer, but it is best viewed on a desktop or laptop computer.) But I prefer having the entire series episode. Another visual or two along these lines include satellite images of carbon dioxide concentrations. I have older ones on the same webpage on the other end of the link, as well as videos showing satellite infrared imaging of carbon dioxide concentrations over the months and years. The imaging is based off of the reduction in infrared radiation reaching space due to rising levels of carbon dioxide. As such, what is being imaged is essentially the greenhouse effect in action. Moreover, the measurements obtained by satellite agree with independent air sampling (“flask”) measurements to within 1.5 ppmv, which is a good indication of just how well we understand the greenhouse effect in terms radiation transfer. This is what happens with UV light, Electronic transitions, however in the IR spectrum it is Rotational and vibrational energy levels of the bonds that are involved, there is no excitation of electrons. While rot/vib levels can emit radiation they are unlikely to do so in the troposphere because the lifetime of the excited states is so long that they are more likely to be deactivated by multiple collisions with neighboring molecules. Around the tropopause conditions favor emission (far fewer collisions). “Global warming caused by burning carbon, from whatever form, is a reality. In order to understand why it is so, is fairly easy to explain, however, there are a few things that you have to be aware of. Just about all of the energy that gives rise to the warmth of the earth comes from the sun (only a tiny amount derives from the earth itself). That energy comes via radiant energy, it is the only form of energy that can travel through the vacuum of space. Most of the gases in the atmosphere are transparent to the suns heat, which means that that they will not heat up the atmosphere significantly as a result of the suns heat passing through. However, the atmosphere contains a few gases that are not transparent to the suns heat. They are called the greenhouse gases, the most important one is water vapour, followed by carbon dioxide and a few others. The ground of course is significant as well, it heats up depending how dark it is. Next thing to be aware of, you may be familiar with the effect that when you get higher it gets cooler, A valley will be warm, the mountain tops are snow covered. The reason it gets warmer as you get nearer the ground is due to those green house gasses, that temperature relationship with altitude is called the “lapse rate”. You need to also appreciate that the earth looses all the heat it receives from the sun, if it did not, the earth would cook, think how hot the inside of a car parked in the sun gets. The only way that heat can escape from the earth, ultimately, is in the same way it came in, via radiant energy. It is the greenhouse gasses that act as a blanket, the radiant energy can only escape back into space when the amount of those greenhouse gas molecules thins out as the atmosphere becomes less dense. By adding more CO2 to the atmosphere it increases the altitude at which the radiant energy can escape the earth, however the lapse rate changes very little, as a result it gets warmer at the earth’s surface. For many years, it was thought that as carbon dioxide is thermally saturated at sea level, that adding more would not make any difference. That was realised to be a silly idea during the 1950’s when heat seeking missile were being developed. The sea level saturation is irrelevant. A simple way that you can think about the effect of adding CO2 to the atmosphere, is that it is like making any point on the surface of the earth deeper in the atmosphere from a thermodynamic point of view, not of course, from a pressure point of view. There is a Climate Scientist, Richard Lindzen, who came up with a theory that as the earth warmed, the amount of water vapour will get higher which is true, and as a result, more clouds will form reflecting the suns heat. However that has not been observed, and judging from the geological record, that does not happen. > cross section of atmopheric column. It’s too bad the AIRS imagery uses red to indicate more CO2. It gives people the wrong impression. Darker gray shading to black would be more apt since it’s opacity in the IR. How can convection “maintain” the lapse rate? I confess I am at a loss as to why convection is mentioned in an essay about the greenhouse effect; all convection can do is reduce net absorption by increasing radiation at the emission height. Now that the GHE is correctly described, I want to renew my call for GISTEMP to follow HadCrut and publish the monthly baseline that produces anomalies in the analysis so we don’t have to hear silly things like January was the hottest month. It is wrong and it lacks poetry. #44 Jim Eager, thanks for that, do you think it would be better if I change the wording to: “the atmosphere contains a few gases that are not completely transparent to the suns heat. They are called the greenhouse gases”? For LM – I think Jim E’s point is that “the sun’s heat” isn’t some special kind of heat. Most of the energy arriving at Earth from the Sun is visible and higher energy photons, not “heat” (not infrared) (energy reaching the top of the atmosphere, and some of that penetrating all the way to the solid and liquid surfaces before it encounters something that turns the photon’s energy into vibration — dirt, for example, gets warmer when sunlight hits it). Most of the energy departing the Earth’s surface _is_ in the infrared. You are right, of course. Actually that is what I do with water vapor at 4, 6.7 and 11 microns. It gives the earth a rather eerie appearance, and makes the cold tops of high altitude clouds appear dark while warmer land appears white. Like the images of carbon dioxide, the original images of water vapor (the three that I combined into one) showed water vapor as lighter in color against a dark planet. For a more “faithful false color”, I combined their negatives, representing the three channels in red, green and blue, and consequently the planet has predominantly pale violet and pale green colors, with the cold top of a tall tropical storm appearing almost black and relatively warm land showing through a drier troposphere appearing white. But as with infrared weather satellite imaging of water vapor used in weather reports where clouds and water vapor appear paler grey to white, the AIRS imagery favors familiarity over accuracy.